You are currently browsing the category archive for the ‘State Budget’ category. Despite all 50 states convening for session in 2011 with legislators from 39 states returning in January, at least four states returned or plan to return for a special session in 2010. New York Governor David Paterson (D) called an extraordinary session beginning November 29 to discuss a budget deficit of $315 million before the end of the calendar year. Although legislators have yet to make much progress in reaching a budget solution, they passed a measure to eliminate certain cost-sharing requirements for tier IV prescription drugs considered to be too cost prohibitive for those with serious and often life-threatening conditions. Declaring a fiscal emergency in the state, California Governor Arnold Schwarzenegger (R) called a special session to begin December 6th in order for legislators to begin chipping away at the state’s $6 billion budget deficit—which the Los Angeles Times reported may grow to as much as $25.4 billion over the next year and a half. Governor-Elect Jerry Brown (D) has until January 10 to propose his budget for the state legislature to consider during the regular 2011 legislative session. Governor Chris Gregoire (D) is pushing for a December special session for Washington State legislators to enact a series of drastic spending cuts balancing the state’s budget through July. Although the Governor made across-the-board cuts to many programs earlier this year, the deficit grew by about $385 million due to slow growth in tax collections. According to incoming House Majority Leader Pat Sullivan (D), Democrats prefer a full supplemental budget over Governor Gregoire’s suggested cuts, which include eliminating the Basic Health Program, a program providing subsidized medical insurance to low-income individuals and families. Although the Governor does not need legislators’ permission to call a special session, because a session’s duration is limited to 30 days, she wants legislators to agree on an agenda beforehand. Alabama Governor Bob Riley (R) also will require legislators to return to the Capitol on December 8 to pass anti-corruption legislation. Among the reforms under consideration are full disclosure of spending by lobbyists on all public officials and public employees; an end to unlimited gift-giving to public officials; and a ban on pass-through pork spending. June 18, 2010 – UPDATE: According to American Medical News, the federal government pays for 57 percent of Medicaid costs on average, varying by state. The 2009 economic stimulus package increased this average by at least six percentage points through December 31, 2010, which helped prevent significant program cuts, including reductions in physician pay. The National Conference of State Legislatures says at least 33 states as of late April 2010 proposed or adopted budgets that included the expected (not yet passed by Congress) additional federal dollars. The Senate version of the American Jobs and Closing Tax Loopholes Act would continue enhanced Medicaid stimulus funding through June 30, 2011. California Governor Arnold Schwarzenegger is attempting to address the state’s $18 billion fiscal 2010-11 deficit by proposing to end the state’s welfare program and require co-pays for Medicaid enrollees. 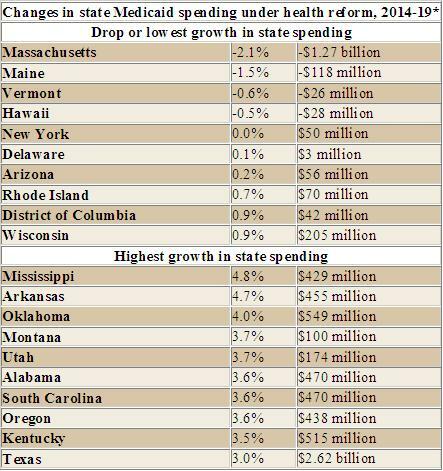 All states, with the exception of Vermont, are legally required to balance their budgets annually or biennially. 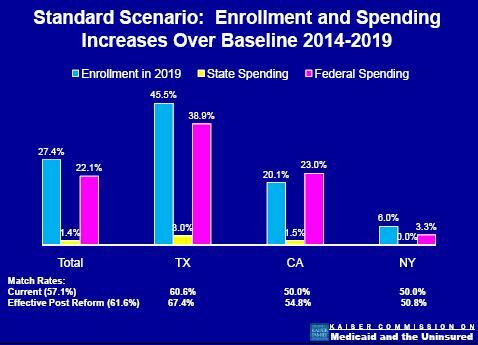 To accomplish this, states attempt a variety of approaches to cut spending and increase savings — and Medicaid is often one of the first state programs on the chopping block. Governor Rick Perry (R) recently released a plan to save $1.2 billion in the current Texas FY 2010-2011 budget. With the state Medicaid program reduced by $64 million, provider reimbursement rates were not spared. 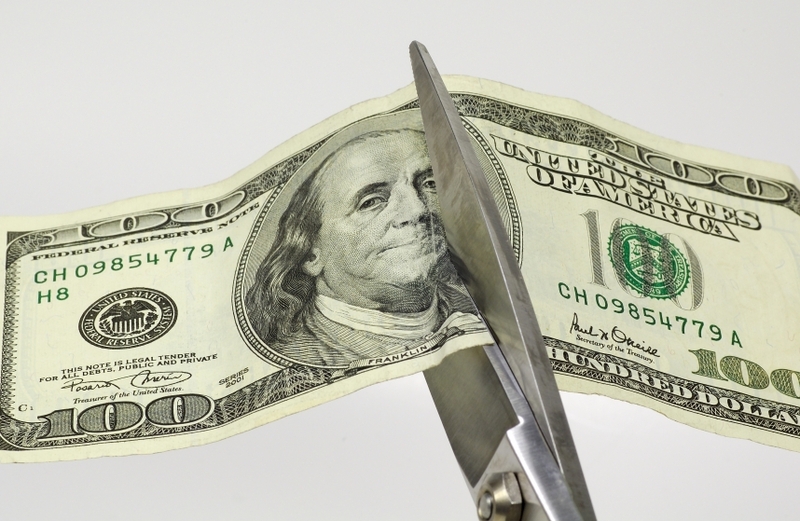 Although a two percent cut was a possiblity, some are concerned the one percent reduction taking effect September 1 will discourage providers from accepting new patients enrolled in the program. In Missouri, the 2011 state budget approved by lawmakers assumes: (1) Medicaid costs will grow by less than originally projected; (2) savings as a result of several bills that have yet to pass the Legislature; and (3) additional savings by shuffling money among earmarked accounts. Also in an effort to close a $350 million budget gap, lawmakers considered taxing insurance premiums for Medicaid managed care plans, but ultimately removed this provision from the final version of the bill. Currently, only California has such a tax. Arizona Governor Jan Brewer (R) recently signed legislation to restore $385 million to the state’s Medicaid program. The funding cut approved by the Governor in March as part of the state’s FY 2011 budget would have dropped more than 310,000 people from the program effective January 1. The new law also reauthorizes and finances the state’s Children’s Health Insurance Program, which covers 47,000 low-income children. The shift in state policy follows the enactment of the federal health care legislation, which requires states to continue funding health care programs at current levels or risk forfeiting all future federal funding. Voters recently approved a ballot measure to institute a temporary one percent sales tax increase to raise state revenue. Despite pressure from a Democratic-controlled legislature, Minnesota Governor Tim Pawlenty (R) would not approve an expansion to the state’s Medicaid program during budget negotiations. The new health reform law enhances federal matching funds, sweetening the deal for states to enroll more participants in medical assistance programs. Some speculation as to whether the Governor—who is not seeking reelection—is opposing “Obamacare” to boost his chances in becoming the Republican presidential candidate in 2012. In order to maintain funding levels and increase Medicaid recipients, the Alabama Legislature tapped state funds — by transfering from other state agencies, state drug rebates, tobacco settlement funds and provider specific assessments — and utilizing available federal matching funds. The state also is pursuing means to save money within Medicaid by using new technology to aggressively address fraud and abuse.